Wonderfully high in fiber, but don't tell anyone as it will spoil the enjoyment of this delicious bread. Mix until evenly combined. Let rest is covered bowl for 12-18 hours at room temperature or in a warm spot if your home is cool. To bake follow use one of these options. Option 1 (loaf): Grease a 9-inch loaf pan. Dump dough into pan, let rise 2 more hours, covered. Preheat the oven to 450º F and bake for 40-50 minutes. Watch the timing as it may be done sooner, depending on your oven. Option 2: Place a covered oven-safe pot that’s large enough to hold the bread in the oven and preheat to 450º F. Wait 15 minutes past the time the oven reaches its temperature to allow the pot to heat thoroughly. Remove the pot from the oven, sprinkle 2 TBL cornmeal in the pot, dump the dough right into the pot, cover it and return to the oven to bake. Remove the lid after 25 minutes. The total baking time will be about 40-50 minutes. Remove from bread from the loaf pan/pot and cool on rack. Slice into thin slices after it is thoroughly cooled. 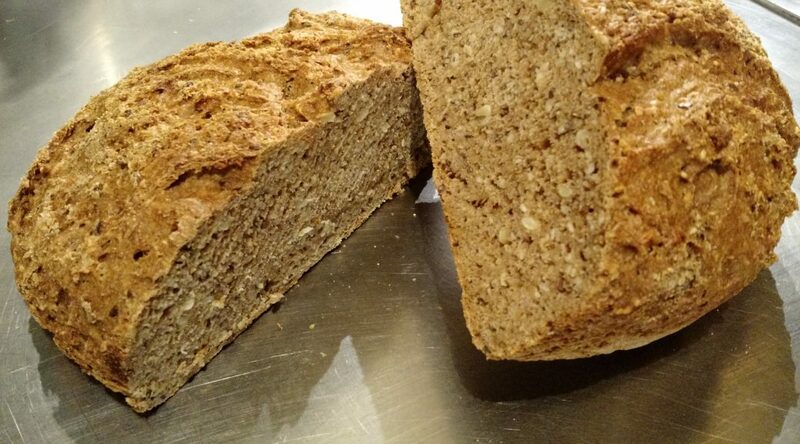 NOTE: Rye sour is a natural product that forms when rye flour is fermented. It is sold commercially as a liquid or powder in a variety of flavors. Commercial suppliers require the purchase of a 25-pound bag. King Arthur used to sell something called Heidelberg Rye Sour in smaller quantities, but no longer do. Instead I keep a rye sourdough starter (that is a sourdough starter I only feed with rye) and use 1/2 to 1 cup of the sourdough starter in place of the dry rye sour. Everything else stays the same in the recipe. You can also make the bread without the sour; the flavor will be different but the bread will still be delicious.